There have been several theories as the the naming of Ellsworth. It has been stated in several historical references Ellsworth was named after a railroad official or surveyor who had helped to survey the right of way through this territory. A son of this man confirmed to Henri Fjetland that his father was a civil engineer who laid out the track from the east. The plan was to have 7 miles between towns. Learning that there was a railroad junction three miles west (Jewell Junction), he questioned the location and put his name with a question mark where Ellsworth was located. Another story is that the town was named Ellsworth to honor the memory of Col. Elmer E. Ellsworth, of the Chicago Zouzves, who was murdered in Virginia in the War of the Rebellion. One source said that it was named for a railroad official, another stated that it was named for an Iowa Falls banker. Some think this was the real reason for the name, as it was confirmed in a book published by the Chicago & Northwestern Railroad Company, which gave the reasons for the names of all of the towns it created. The town of Ellsworth was platted in October, 1880, by John I. Blair, for the Western Town Lot Company, the real estate division of the Toledo & Northwestern Railroad. Ellsworth is located in Section 30-87-23 of Lincoln Township and in Section 25-87-23 of Lyon Township. It has a very close history to two other settlements: Lakin's Grove and Callanan. 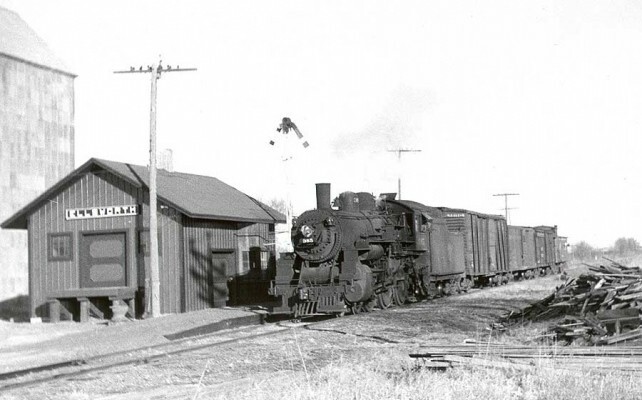 This railroad town drew its population from these two early settlement communities. The Callanan depot was moved to Ellsworth. 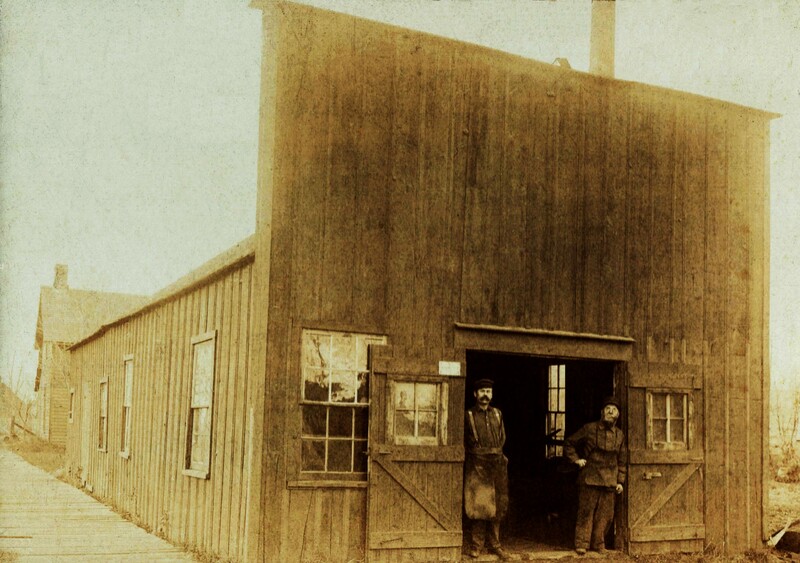 the next to be moved into town was the L. R. Bjelde Blacksmith Shop, which came from Lakin's Grove. The L. R. Bjelde Blacksmith Shop was moved into Ellsworth after the depot. It was moved from Lakin's Grove in 1881. 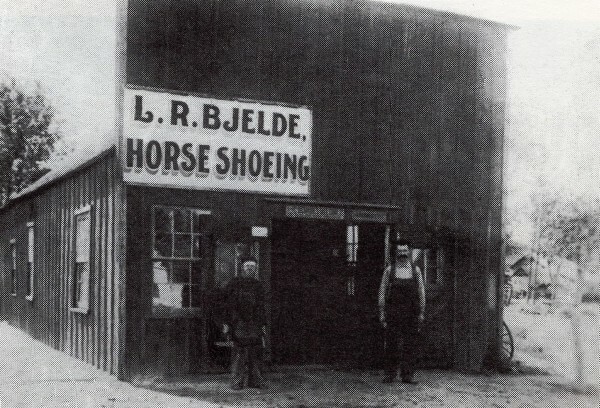 L. R. Bjelde operated this Wagon Shop, and did what the sign suggests, Horse Shoeing. He was associated with Peter Ryberg for many years. This photo of a 16 year old girl shows the first child born in the Ellsworth area. 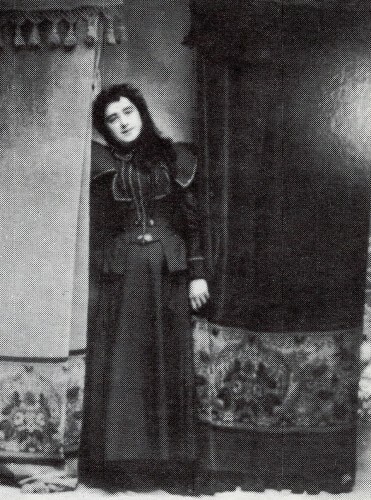 Laura Igou was born on February 29, 1880. She was a grandchild of Luther and Cynthia Lakin. She was the daughter of Milton and Nancy (Lakin) Igou. 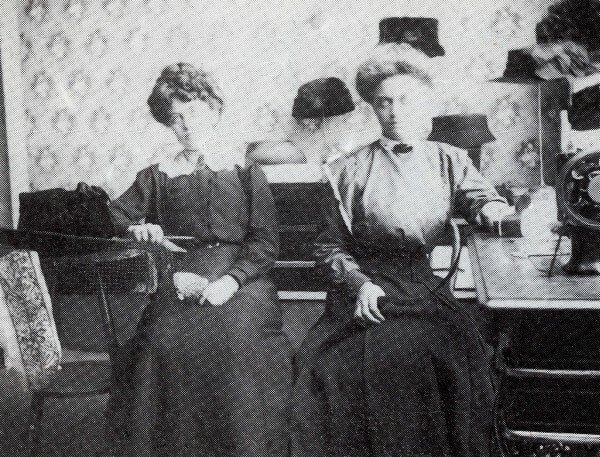 Laura later married John Peterson, and the two were parents of Ruth Peterson (later Mrs. Arnold Sheldahl), and Mildred Peterson (later Mrs. Fred Caudle). 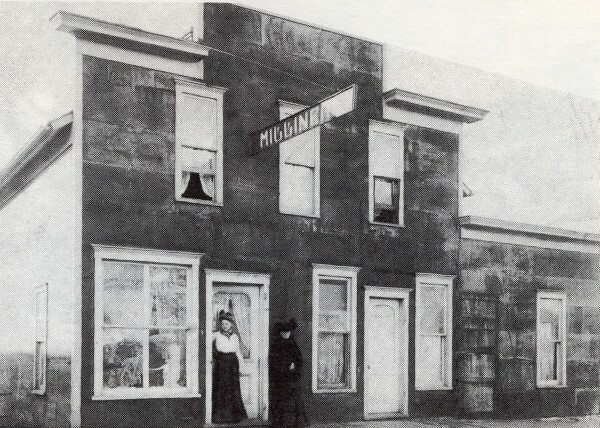 The Millinary Shop was in one of the first buildings moved to Ellsworth in 1880. It was located where the Public Library now stands. It was operated by Marie Vikingstad (Mrs. George Peterson). A Photography shop was on the second floor. The Ellsworth post office was established on Jan. 20, 1881, and is still in service. It was located in the General Store, owned and operated by John Ringstad and Chris Thoreson. That business was moved to Ellsworth from Callanan. Ringstad became the first postmaster. He also served as the first mayor and the first Justice of the Peace. The original plat consisted of eight blocks: four east-west and two north-south. The streets running east-west were Decora, and Des Moines Avenues. The streets runnng north-south were Delphi, Desota, Dewitt, Dayton, Dearborn Streets. It is interesting to note that all seven streets names started with the letter D. This did not happen in any of the other Hamilton County towns. A post office was established on Jan. 20, 1881, and is still in service. It was located in the General Store, owned and operated by John Ringstad and Chris Thoreson. This business was moved to Ellsworth from Callanan. Ringstad became the first postmaster. He also served as the first mayor and the first Justice of the Peace. moved to Fllsworth from Callanan in 1882.
moved to Ellsworth from Callanan in 1893.
moved from Callanan and made into a residence.